I know a great deal about this bizarre world because I have incorrectly been accused of being in the pay of Big Oil. In the early days, I did try to get their money in order to show them why they could ignore the great deception of global warming. I wanted to show them how pseudoscience was being used by ideologists to push a political agenda. The charge by environmentalists that Exxon knew about the CO2 and global warming issue is correct because I, among others, told them directly. The charge that they did nothing is incorrect. They chose to ignore scientific evidence and follow a policy of appeasement, apparently, in the naïve belief they could placate the ideologues and win a PR battle. Right now, I am enjoying watching them squirm and wriggle as they fight lawsuits from those they thought they appeased. They now know Churchill’s definition is correct. They also learned the difference between what they do and what environmentalists do. Mason Cooley explained it pithily. While the bizarre legal battle plays out in US courts, I learned from recent overtures by major players in the Canadian energy sector that they now realize their policy of appeasement with the left-wing environmentalists did not work. FOS chose to stick to the science but were bloodied early by the politics. They have done a commendable job on the science. While their “science only” position is commendable because ideally, all science should be apolitical, it guaranteed little or no funding, especially from those agencies who could benefit from a clear, simple exposition of the science. The question is why wouldn’t energy companies do climate research? There are few industries whose management, demand, and production cycles are more driven by climate. For example, the fact they vary the percentages of gasoline and home heating oil significantly from summer to winter. Frankly, I would not invest in a company that did so little research into understanding a major driver of its market demand. Historically, capitalism was simple and predictable. It was about profit, and the only debate was around what was a reasonable profit. In the Middle Ages, governments set limits on profit, usually up to 9%, based on pseudo-religious values with any higher deemed usury and therefore immoral. There is no time or need to go into all the social and religious ramifications of those beliefs and actions. Suffice to say all these issues and debates continue today, albeit within a different set of values and constructs. Part of this is related to the founding of America with the escape from religious persecution of the Plymouth Brethren on the Mayflower. They considered profit good as long as it was balanced by a strict tithe to the church. The religious views that formed the basis of history and economy in the western world up to the mid 19th century were challenged by Karl Marx in his most influential publication, Das Kapital in 1867. Note that this is only 8 years after Darwin’s On the Origin of Species. It is reasonable to equate Darwin with the basic concept of capitalism, the survival of the fittest. After reading Darwin’s great work, Herbert Spencer coined the phrase. Darwin liked it so much he incorporated it in the sixth edition. All this changed in the 20th century because Darwin’s work was used to challenge the existence of God and this juxtaposed formal religion against science. Because God was no longer the reason for humans being different in the academic world, it culminated in universities adding a completely new faculty, the Social Sciences, to the historic faculties of Arts and the Humanities, and the Natural Sciences. Remember, Darwin, was identified as a naturalist, not a scientist. This change and the impact on society continues as central to the debate today through the writings of Richard Dawkins and others. It all resulted in the demise of the influence of formal religion and created a moral and ethical vacuum among young people. The battle was starkly enjoined as recently as 1925 with the infamous Scopes Monkey Trial. John Scopes was prosecuted in Tennessee for violating Tennessee’s Butler Act, which forbade the teaching of evolutionary theory. The real issue was the need for balance in education, not indoctrination. What should happen is that at a minimum both creationism and evolutionary theory be taught, and students establish their opinions. 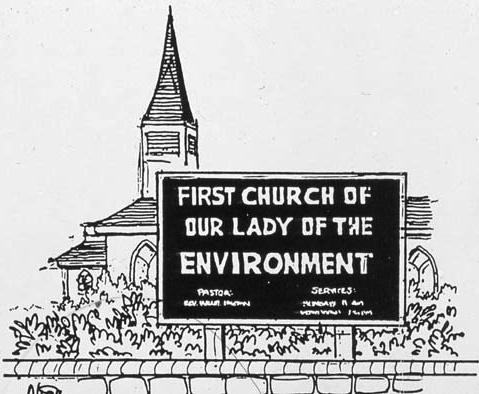 We must get the religion out of environmentalism. We must get it back on a scientific basis. Too many organizations are simply lying, pure and simple. This is not going to happen for some time because like most great religions or fascist organizations it realized that it was necessary to control the education system. Children graduate from a school system that baptizes them into the environmental religion. The impact and extent of the changes are seen in the complete overturn of the order of learning. Just a few years ago, the older faculty held the prevailing wisdom and were challenged by the new young faculty. Now the young faculty comes into the system fully indoctrinated and unquestioning while the older faculty retain the necessary skepticism of a scientist. The power of the moral high ground was quickly controlled by those who saw the political potential of environmentalism. So, the eco-bullying began and swept away the logic and rationale of science. Energy companies chose to appease, but it was an easy choice because there was no financial cost. They could pass on their appeasement costs, including carbon taxes, to the consumer. This means they were able to act with immunity, impunity, and without accountability. Now I enjoy watching the bizarre situation of misplaced accountability; they are being sued for deliberately failing to do the right thing. It is all being adjudicated in a legal system that traditionally avoids scientific disputes because it admits it knows nothing. My sympathies are with the energy companies because it is fossil fuels that have raised humanity from marginal starvation and short life spans. Environmentalists are parasites who produce nothing while attacking those who do. They also, hypocritically, enjoy the benefits of what fossil fuels provide. Meanwhile, I enjoy the bizarre dance they both perform with no rationale or justification. A plague on all their houses, but a more lethal one, as survival of the fittest would allow on the non-productive one.